Do not use La Crosse Weather Connect app with this product! It seems to break this device without giving you the promised access to the wunderground network. Only their New “View” app is supported. I’ll see if I can add support for it to wufyi. 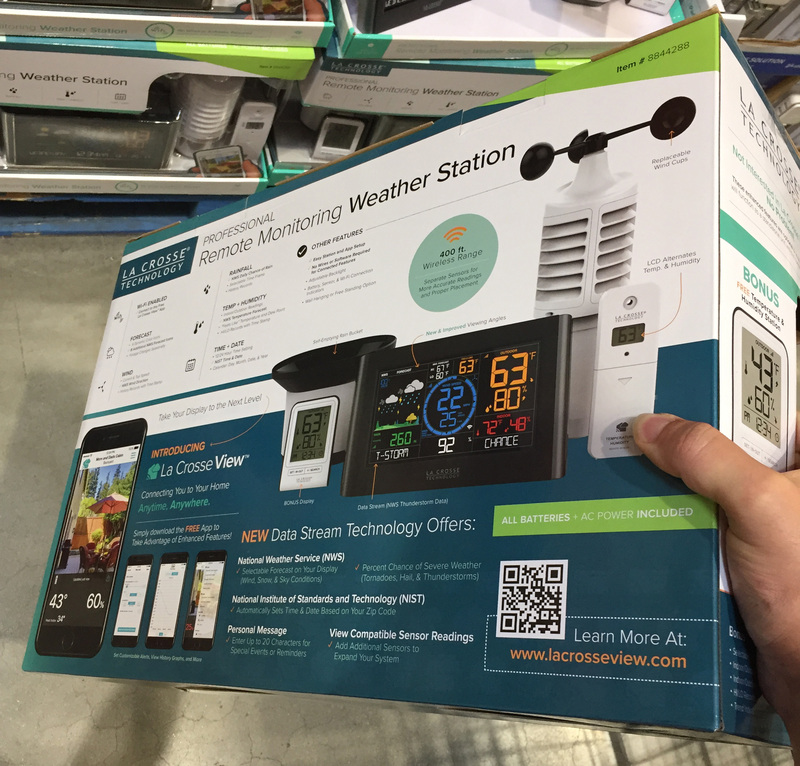 Costco websites mentions 5-in-1 sensor, which is clearly incorrect as I count only 4 outdoor measurements (wind direction and pressure measurements seems to be missing) across three separate devices (thus correct name would contain 4-in-3). Still, it does come with a wifi build into the display, which is nice since it does not require a separate dongle and display actually does show weather forecast from the net. Has anyone tried this device? Reviews seems to indicate that it is less than perfect, but with the great Costco return policy it may be the the cheapest way I know of to get the local weather data to the internet (and Rachio). Display having a wifi connection for data upload / forecast download. P.S. While costco return policy is great, their stock doesn’t tend to be consistent. If this thing fails three weeks or four years from now, you may be able to return it (if you keep the box), but not exchange it. Official warranty on this seems to be 1 year. I’m interested in this as well. Is there any way to know if it would work for Rachio? It supports data upload to wunderground. While this is not directly supported by Rachio, you can setup a free data transfer from www.wunderground.com via www.beta.wufyi.com over to www.pwsweather.com (you will also need to use www.cron-job.org to automate the process). After that you can use this station with Rachio. I was looking at the same PWS at Costco myself just a few days ago, and wondered about the pros and cons of using it versus selecting one of the other stations nearby (about 5 or 6 to choose between within a 4.5 mile range). A bit disappointing that it’s battery operated and that there aren’t options to either plug-in, hard-wire, or have it solar powered. Thx for sharing the info about the beta WU data porting site. I’m wondering how long this has been in beta, and whether (weather? ) WU is planning to move this from beta to production any time soon. As with the battery, I tend to worry about parts of an overall configuration that are temporary…if I forget to change a battery, I would eventually stop getting readings… If the beta is shut down and moves to prod and I’m not aware of the change, I’d also stopping getting data and not necessarily be aware of this. I’m saying this with the idea that I’m hoping to move from the “tinkering” stage with all my smart home automation, so that all aspects of it become more invisible - and just work over the long run. I’d like, ideally, to be able to enjoy all the smart home automation on a passive basis, and have the various components only require attention if they notify me of problems. Maybe that’s a bit lazy - but my thought is that this is where smart home automation should be headed. Sorry for the overly long comment – I appreciate all the info and possibilities, just sharing a bit of stream-of-consciousness on some of this. wufyi.com is a little pet project by yours trully (@Gene), so you’ll probably get a better support at support@wufyi.com than over at wunderground. It does not require an API key, saving a need for a tedious registration with wunderground. It is resilient to somewhat “noisy” data coming from the wunderground’s “conditions” API channel which solutions were relying up to this point. At this point it has proved to be as good, or better, than core www.wufyi.com service as far as reliability. When I get a chance, I’ll finish up coding the improved setup user interface which would make the setup easier that allow wufyi to switch over to the internal cron service and officially “release” all of the improvements that beta is currently testing. Alas, with my current workload, I can’t seem to find much of free time to spend on this. Meanwhile, if you setup email notifications with www.cron-job.org, you’ll get an email notification if something goes wrong with wufyi / data exchange. Thanks for the quick reply - most appreciated, especially as I’m now in touch with the author / developer. Sorta feels like I’m in touch with a celebrity of sorts! (I’m a long-time IT guy, not a weather expert, but weathered, so to speak…). Your recommendations make sense, and it’s great that you’re offering this layer to simplify things for the rest of us. I understand the time considerations too. I’ve had a number of projects over the years that, unfortunately, often have to take a back seat to “real life” (bummer!). Also great to learn about email notification from cron-job.org – I clearly need to start exploring this area and get up to speed. I’d love to learn more about the history of the project, how you’ve built / are building it, etc. Any info you can / are willing to share would be of interest! (and can be taken offline if not appropriate for this forum). If you are curious, the start is documented here (link), and it is (for now) primarely based on a simple “data in, data out” model. You can check out the source code here (link). I wanted to run it on PHP since this is widely supported by majority of web hosts out there. Alas, as documented here (link), officialy recommended data stream from wunderground is full of bugs (false data intergected into the data stream). Finally beta portion of the site was officially developed for AcuRite compatibility, as documented here (link). I’ve run into some issues with beta and growing user base and been quietly tinkering to improve performance / reliability of the site as well as develop a reliable and efficient way to support more users. In any case, I’m planning on putting an updated “core” source code onto github after the changes have proven themselves reliable. So even should wufyi ever go down, many mirror sites can quickly take it’s place. Excellent! I’ll have to check this out over the weekend. Thanks! Where did you see that it supports data upload to wunderground? I’ve seen reports to the contrary. WoW! I’m not sure, for some odd reason I thought I saw the support for it somewhere, but now I can’t find where I may have seen it (damn). Good catch @bridavis! I guess I"ll have to take a look at this “view” app, see if I can add support to wufyi. Display: Nice LCD display, overall I like the battery backup feature and how display looks. Pros during setup: I’ve discovered that all of the sensors have a unique ID. Rain sensor: Mass produced to be as accurate as initial manufacturing tolerance. Cons about Rain sensor: No way to calibrate the device at the factory or at home. Wear & tear (on plastic cup / standoff) as well as outdoor elements will make this sensor inaccurate overtime if it was accurate to begin with (no factory calibration is possible). Wind sensor: Overly big, shape makes it apparent that the wind sensor used to feature a temperature / humidity sensor as well, but even though now they’ve are separate devices wind sensor shape was not optimized to save engineering costs. Cons for wind sensor: Needlessly large sensor size will cause more air resistance and create unnecessary force onto whatever support structure the sensor is connected to. There is also no wind direction measurement making this system able to only measure 4 outdoor measurements. Pro: features a display allowing for outdoor temperature check. La Crosse Weather Connect app: Oh boy, here we go. What a mess. This is an official app which theoretically allows: “Users [to] register their Weather Stations to Weather Underground through the app if they so desire.”. That app app does not seem to work with this model. While it allows you to input the wundergournd info and “setup” the wifi on the device, it appears to have no functional effect and the base shows “no connect app server” error after a little while. La crosse view app: This app is a pain on so many levels. First of all it has originally failed to “find” the display while it was provisioning (wifi emblem blinking to indicate that it is searching for wifi). Second of all even after a succesful setup, I’ve started getting “no connect app server” errors constantly (which may or may not be related to me trying to get Weather Connect app to work). The crazy thing is that in order to try fixing the “no connect” error, I’ve created a new account and after deleting all of the sensors and display from original account, I’ve tried to add them to the new account. This has resulted in system giving me an error that the display (and probably the sensors) are owned by a different account (which at that point has no sensors associated with it). So if you ever wish to sell / give away this PWS without giving away your account, you would need to contact support team. Weather underground seems to be not supported, even though they have an app for that. Phone support “does not support” connectivity features of the this product. I’m stuck waiting for support ticket to be noticed by who ever can actually troubleshoot this thing. If you try using their Weather Connect app, it may brick your ability to connect to the “view” app without giving you any benefit in return. At this point my recommendation is “DO NOT BOTHER!”, this product really is not worth the pain. If you’ve already bought yours and were lucky to get it running with the view app, send me an email to beta@wufyi.com, I’d be happy to see what I can do to get your data out of their closed garden.